High resolution imaging of materials structure is a hallmark of materials science, but properties should also be resolved on the nanoscale to establish quantitative nanoscale structure-property relationships. Our group combines electrical transport measurements with scanning probe techniques to visualize the electronic, optical, and magnetic properties of nanostructured materials with a resolution commensurate to that of structural probes. Nanowire devices can offer higher performance than their planar counterparts, but a quantitative understanding of the operating principles is a necessary foundation for rational engineering and optimization. We have used scanning photocurrent microscopy (SPCM) to image the operation of a high-performance nanowire field effect transistor under varying operating conditions. J. E. Allen, E. R. Hemesath, & L. J. Lauhon, “SPCM analysis of Si nanowire field effect transistors fabricated by surface etching of the channel,” Nano Letters 9 (5) 1903-1908 (2009). The metal catalyst atoms used to grow semiconductor nanowires have the potential to seriously degrade the performance of minority carrier devices such as bipolar transistors and photovoltaics. By making the first measurements of minority carrier diffusion length in nanowires as a function of diameter and doping level, we demonstrated that the nanowire surfaces, and not metal impurity atoms, limit the diffusion length, a finding of significant importance for nanowire solar cells. J. E. Allen, E. R. Hemesath, D. E. Perea, J. L. Lensch-Falk, Z.Y. Li, F. Yin, M. H. Gass, P. Weng, A. L. Bleloch, R. E. Palmer, and L. J. Lauhon, "High-resolution detection of Au catalyst atoms in Si nanowires,"Nature Nanotechnology 3, 168-173 (2008). Nanowire devices are often assumed to operate according to simple one-dimensional models found in textbooks, but these assumptions are not always correct. 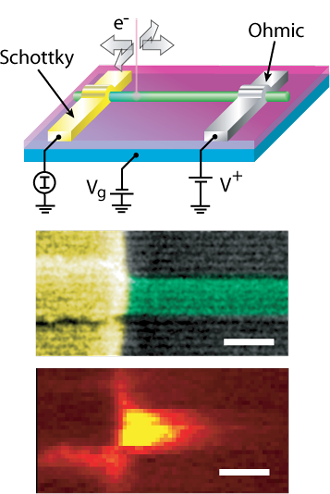 We have developed a near-field implementation of scanning photocurrent microscopy (SPCM) to map the electronic structure of nanowire devices with high resolution. The influence of contact barriers as well as internal heterojunctions on device function can be systematically investigated. K. Yoon, J. K. Hyun, J. G. Connell, I. Amit, Y. Rosenwaks, &L. J. Lauhon. "Barrier Height Measurement of Metal Contacts to Si Nanowires Using Internal Photoemission of Hot Carriers" Nano Letters 13(12) 6183 (2013). S. L. Howell, S. Padalkar, K. Yoon, Q. Li, D. D. Keloske, J. J. Wierer, G. T. Wang & L. J. Lauhon. "Spatial Mapping of Efficiency of GaN/InGaN Nanowire Array Solar Cells Using Scanning Photocurrent Microscopy" Nano Letters 13(11) 5123 (2013). E. Koren, J. E. Allen, E. R. Hemesath, L. J. Lauhon, & Y. Rosenwaks, “Non-Uniform doping distribution along silicon nanowires measured by Kelvin probe force microscopy and scanning photocurrent microscopy” Appl. Phys. Lett. 95, 092105 (2009). J. E. Allen, E. R. Hemesath, D. E. Perea, and L. J. Lauhon, “Non-Uniform Nanowire Doping Profiles Revealed by Scanning Photocurrent Microscopy,” Advanced Materials 21 (30) 3067-3072 (2009). 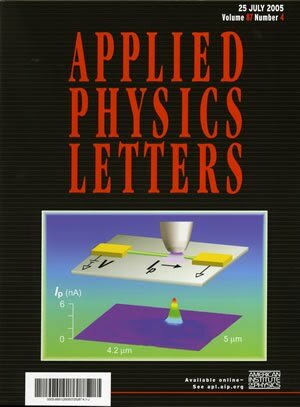 Y. Gu, J. P. Romankiewicz, J. K. David, J. L. Lensch, & L. J. Lauhon, “Quantitative Measurement of the Electron and Hole Mobility-Lifetime Products in Semiconductor Nanowires,” Nano Letters 6, 948 (2006). Y. Gu & L. J. Lauhon, “Space-charge-limited current in nanowires depleted by oxygen adsorption,” Applied Physics Letters, 89, 143102 (2006). Y. Gu, J. P. Romankiewicz, J. K. David, J. L. Lensch, E. -S. Kwak, T. W. Odom, & L. J. Lauhon, “Local photocurrent mapping as a probe of contact effects and charge carrier transport in semiconductor nanowire devices,” J. Vac. Sci. Tech. B 24, 2172 (2006).